Sites for overnighters are at the far west on the park, the oldest portion of the park. It is closest to the millions of chickens at the egg farm which in turn is the stinkiest area. The long terms are at the opposite end and that's a good idea. The pull through sites are level and long enough for me and Car but had to relocate due to lack of proper power at the pedestal. Checked 3 power pedestals before I found a good one. They charge for WiFi and there is no cable tv. The Park is pretty clean but at the dog area on the picnic table there were rat droppings all over like some one had been feeding the rodents. Probably won't return to this park. We camped at Saddle Mountain RV Park in a Motorhome. Beautiful grassy and clean! 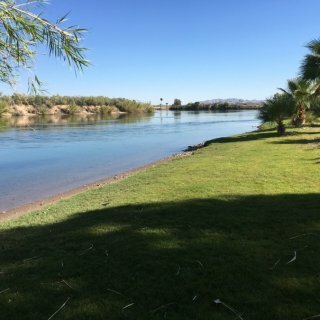 You don't find any grassy rv parks in this area and so this is quite the oasis! Long grassy sites with some shade trees. Easy river access and atv trail access! Dog friendly with a nice grass fenced off leash dog area. Sites are level, wifi works, power water elect are great. Bring your water toys or ATVs! Lots of room to play on the river. We Love this park and will return! 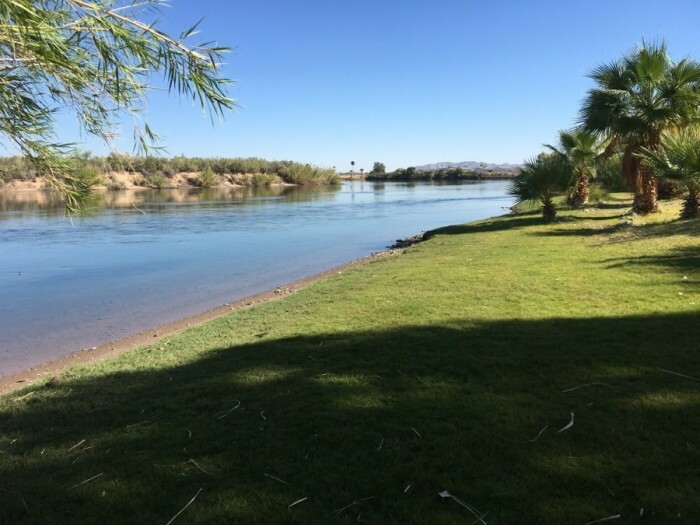 We camped at River Breeze RV Resort in a Motorhome. Go shopping before you come here there is one Albertsons in Blythe CA. about 5 miles away. Lots of off road opportunities. You can swim in the river right from the grassy bank.! You're out in the desert, no city life here, lots of nature! You can drive up river about 40 miles to Parker for shopping or hospital. Beautiful entrance to the park! Easy to check in and the receptionist was really friendly and nice. We pulled into our site then realized it wasn't the correct site....they fixed it so we didn't have to move. Electric box needs the 50 amp plug updates as it's plastic receptacle is broken. It worked but the power is hovering on the 110-114 volt line. Sewer is at the back of the site on pull through so we didn't hook up for 1 night. There are 2 water spigots and one leaks profusely so I used the other one. The sites are narrow asphalt and roads are narrow! There are trees at most all sites for shade. Some are citrus and when ripe you may help yourself. The shaded dog run was really overbearing with urine odor, my dog would not go inside! They may want to use lime to keep it slightly more sanitary if possible. Probably will not return to this park. We camped at Destiny RV Resort / Phoenix West in a Motorhome. Had a Lakeview site! Nice long asphalt pad with beautifully designed picnic table area. Plenty of room for the coach and the car. Verizon works but not but 2 bars. Wifi good at the registration building. Love the stay but the price is about $5 too high. 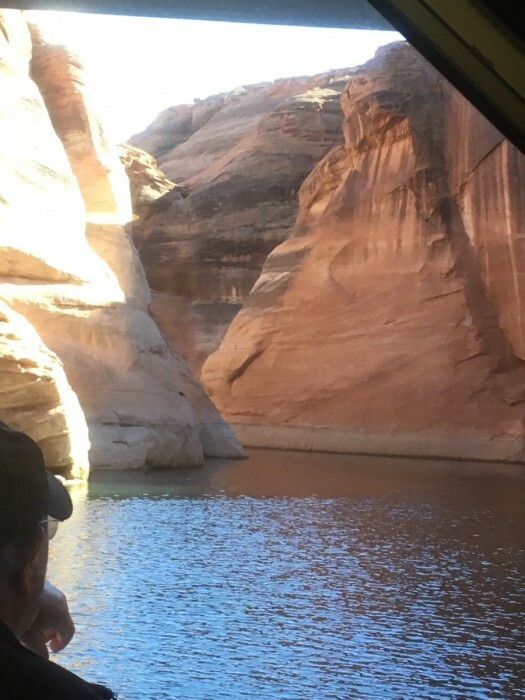 But it's Lake Powell!❤️ The park is really well kept and clean. Easy access to the lake. Sections A, B, C, are all single spacious sites. Some back in some half circle pull throughs. D & F are close together and they're all pull throughs but your neighbor goes one way and you face the other like buddy sites but the doors are opposite. Will definitely return!!! We camped at Wahweap RV and Campground in a Motorhome. 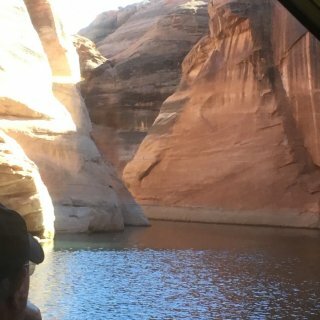 Took a cruise via the Wahweap Tour boat to NavajoCanyon and Anteloe canyon.Sections A, B, C, are all single spacious sites. Nice place, great staff, clean and has really good electric water sewer and Wifi! The sites and roads are gravel. Sites are pretty level. The laundry is very clean and reasonable. It has a cute gift shop with local items, Tees and sweatshirts. Has trees at each site for shade. We camped at Hitch-N-Post Campground in a Motorhome. Check in at the casino and they'll let you know what sites are available, or call ahead for a reservation. Nice people in the casino are very helpful! Nice park with all pull thrus. 20/30/50 amp service sewer water, all worked well. Laundry has 1 washer & 2 dryers $1.25 each. They're doing construction on a new large event center or hotel and the rv park is smaller due to half the sites being closed. We stayed in B section and it was fine. Lots of grass, picnic tables under a roof with BBQ grills. It's a dog walking area. The casino is an easy walk and in the casino is the Buffalo grill. There is a fueling center and grocery store. Will definitely stay here if we're in the area. We camped at Buffalo Meadows RV Park (Fort Hall Casino Campground) in a Motorhome. Close to Pocatello if you want to go to the city, otherwise everything you need is at Fort Hall! Beautifully landscaped. Many lot owners with gorgeous coaches and landscape. Grassy sites with close views of the golf course. If you golf this is the place for you. Good power high water pressure sewers hookups needed 20' hose. Sprinklers come on 2x a night! We had a backin site then moved across the street to a head in site. Nice long wide sites, patio & table. We camped at Spokane RV Resort in a Motorhome. Bring your golf clubs! The Golf course is in the middle of this park! Nice restaurant at the golf course! Don't use the detailer "Trusted Detail" he's no good.